Traditionally the first problem of April Fools Day contest asks to recognize a sequence of integers by problem title and (this time) a single data point. OEIS search for just the given number isn't going to give a result — or rather is going to give too many to be useful. However, if you look for the problem title, the first result for "numbers joke" query will give you https://oeis.org/A006753 "Smith (or joke) numbers", which has 27 as its 3rd element. 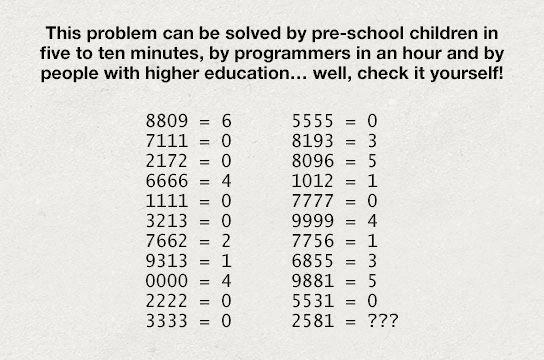 This problem is a variation on a kid's riddle in which you have to count closed loops in digits of the number — one in 4, 6, 9 and 0 and two in 8. Since we're programmers here, we had to count loops in digits in hexadecimal notation of the number (writing A..F in upper case). Each line of the statement is a compilation/runtime error message in the truly April Fools language INTERCAL, which differ from the real ones in a single word. If you compare them with the real error messages, modifies words will spell the task: FIND XOR OF LARGEST AND LAST ARRAY ELEMENTS. How can a palindrome be "touchy"? You have to write the number in Braille font and check whether the resulting notation is a palindrome. In Braille digits 3 and 7 stay themselves when mirrored, digits 4-6, 5-9 and 8-0 become each other, and 1 and 2 stop being digits. The picture shows a logic circuit which converts four input signals into one output. To make things more complex, logic gates OR and XOR are pictured swapped (i.e. image of OR gate actually means apply XOR gate). Checker verdict "Results unsatisfactory, try harder" combined with the problem title was supposed to hint that the program must show how hard it is to solve the task, i.e. not to output the result immediately :-) The submission was accepted if it spent at least a second on each test. The only problem with a proper solution this year asked to generate a Brainfuck program which would evaluate the given expression. One could take a long way: generate commands to write numbers to memory cells, to add and subtract them and to print the result (this last part is the nasties, requiring dividing by 10 to get individual digits of the result). Or one could use a shortcut: evaluate the expression in a normal language (preferably Python with its eval) and generate a program which would print each digit of the answer. Thanks, that was nice contest. Btw, why we can't see others' solutions? Server time: Apr/20/2019 00:30:07 (f2).